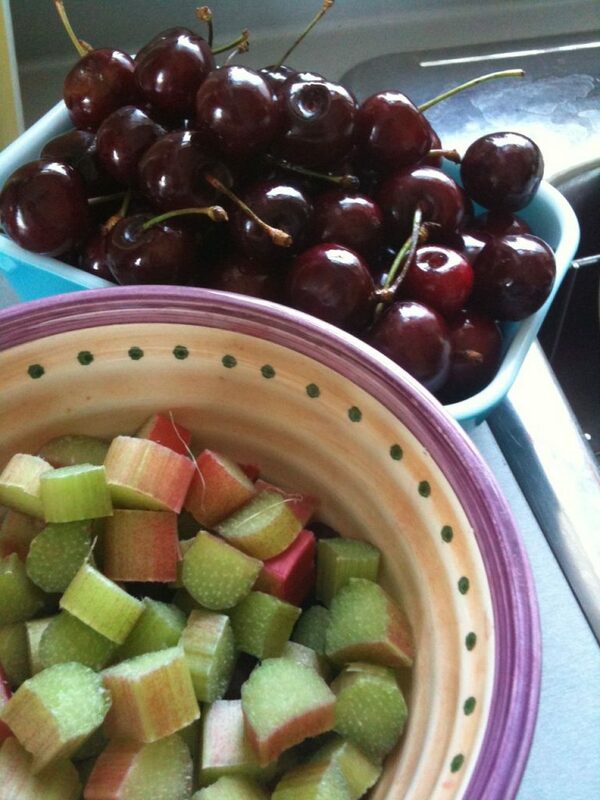 My obsession for all things rhubarb has hit a peak this year. Since discovering this gem of a plant 2 years ago, I’ve become a fanatic. When my mom’s neighbour moved last year, the family let me dig out one of the plants that had been growing in her yard for over 35 years. We couldn’t harvest any stalks this year as the plant needed time to regenerate, so the hunt was on to find friends who had it growing in their yards. It’s gotten to the point where my observant 5 year old nephew, Evan, has become used to seeing me hop fences and work my way into people’s yards. I sure am. But thanks to my sneakiness, I now have a freezer full of rhubarb! Sure, it’s probably more than an average family could consume in a lifetime, but like I said, I’m obsessed. Our freezer is so jammed with the stuff that I’ve had to store any additional finds in my mom’s freezer. Along with the rhubarb, there are also local strawberries and soon, blueberries and raspberries. My head spins just thinking about all that local goodness! Sean is having a hard time understanding why we need so much of it. It doesn’t stop at rhubarb either. It’s gotten to the point where my bike rides to school have turned into foraging expeditions for anything that looks remotely edible. Last week I was standing in front of a house in South Windsor eyeing a mulberry tree and explaining to myself that it was on private property and it just wasn’t socially acceptable to steal people’s mulberries. But I digress. On to the recipe! This is a cake Rose and I tried out a couple years ago when we first discovered the joys of rhubarb. While the original recipe called for strawberries, I couldn’t pass up the opportunity to use cherries Sean and I had picked up (legally…on a farm) while driving around Lambton County. It’s definitely one of my favourite recipes. The cake in this recipe is outstanding. 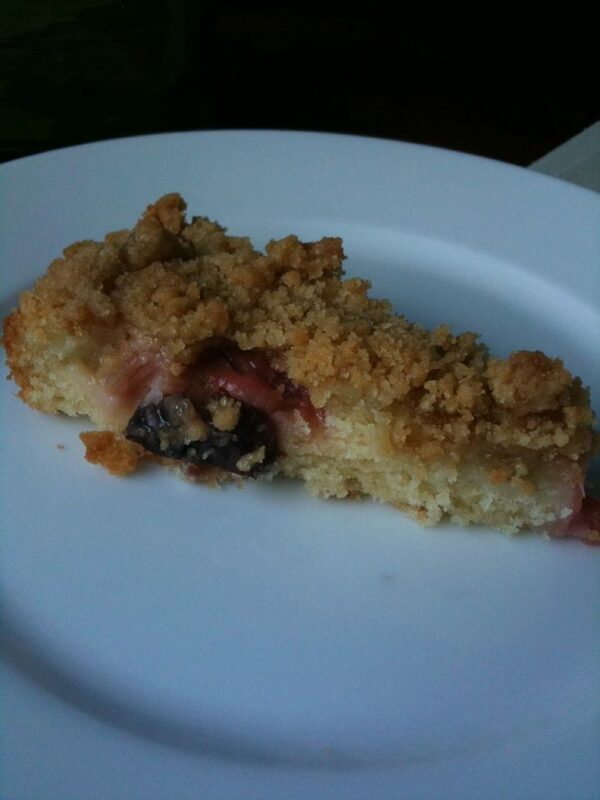 The rhubarb and cherries add a sweet/tart combination, the cake is moist and the crumble on top is oh so crumbly. 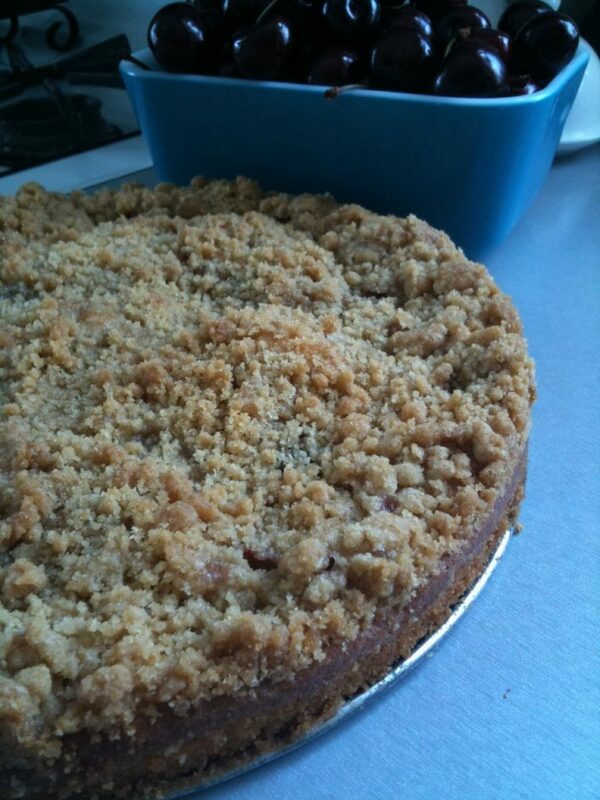 Follow the directions from the Strawberry Rhubarb Crumb Cake. 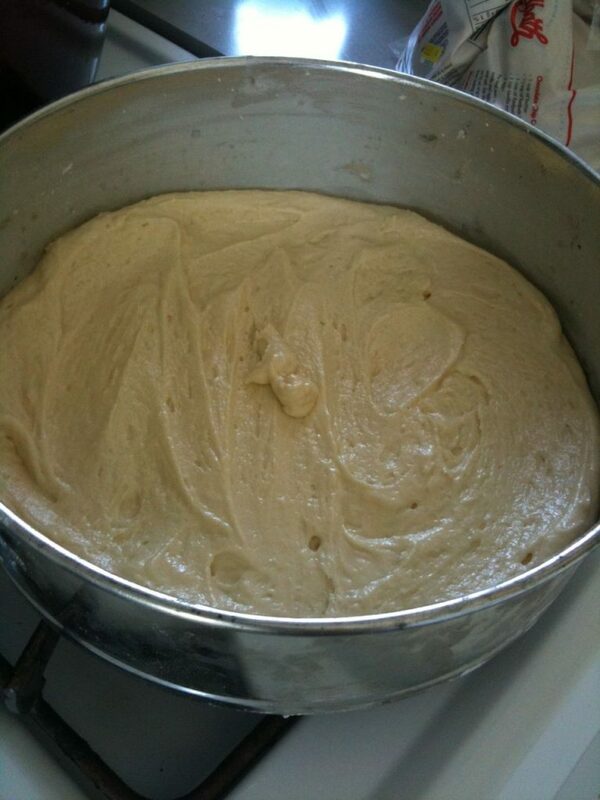 Mix the cake ingredients pour into a greased 9″ cake pan. 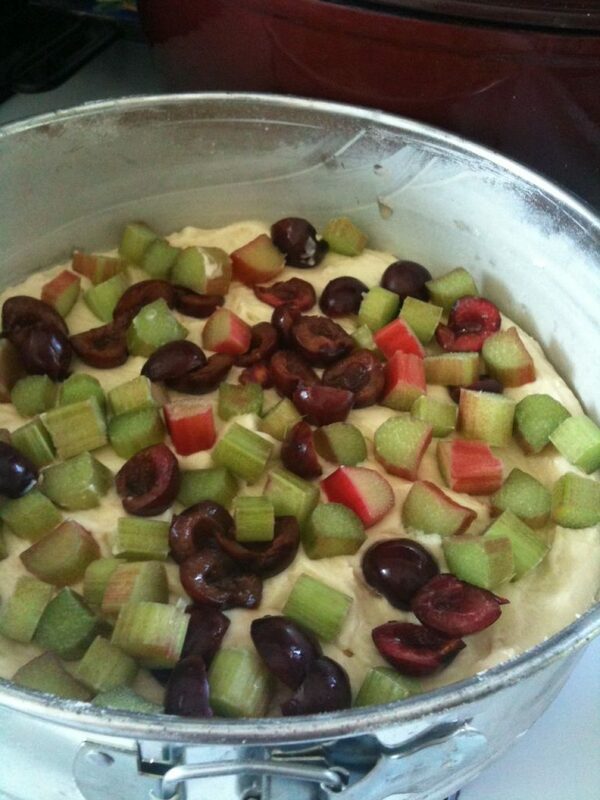 Cover the top with rhubarb and cherries. Don’t be afraid to load it up. I probably could have added a bit more of both. Place in the oven at 350F and bake for 20 minutes. 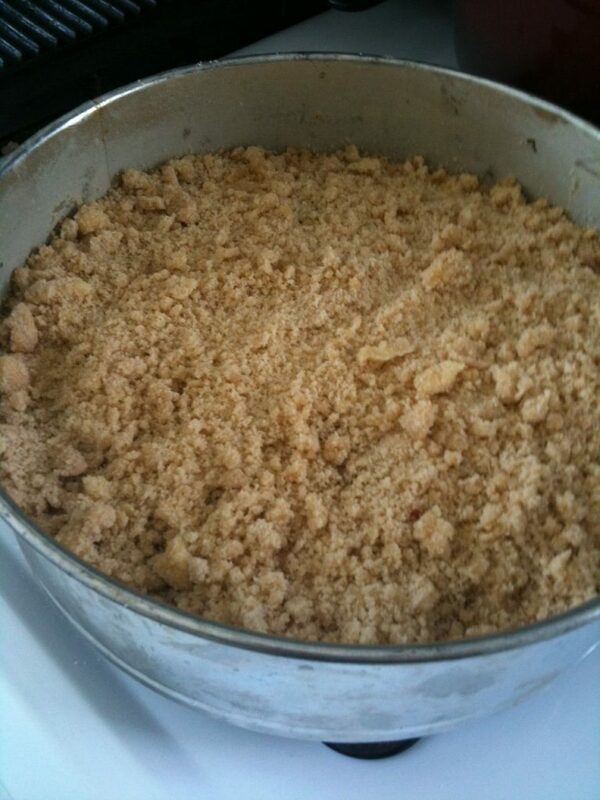 Remove from oven, spread crumble overtop and place back in oven for 15-20 minutes. Once done, let the cake cool. What you get is a great cake using local ingredients. It doesn’t get any better than that. P.S. Thanks to Chris Hewer who let me raid his rhubarb patch while he wasn’t home. Sean said it was inappropriate (and possibly criminal) to show up in your backyard at one in the morning with a flashlight and knife, so I resorted to a daytime raid.